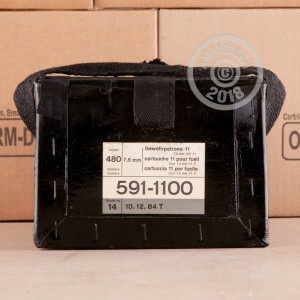 This 7.5x55mm Swiss ammunition from defense contractor RUAG is top quality military surplus following the GP11 specification. Stock up on this top quality ammo for an excellent target shooting experience at the range! 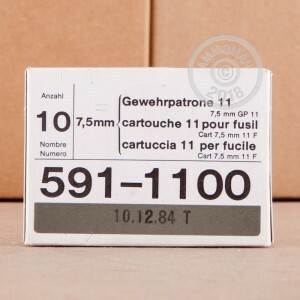 Each round in this box of 10 fires a 174 grain full metal jacket bullet at 2,560 feet per second. The bullet features a boat tail for enhanced stability, enabling it to deliver fully on its long-range ballistic potential. 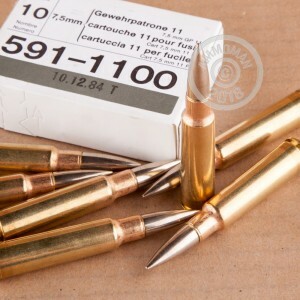 Reloaders take note: These cartridges use brass cases but have non-corrosive Berdan primers. Place an order for $99 or more at AmmoMan.com and enjoy free shipping!